Debris Basins are instrumental components of the flood control system. Typically located at the mouths of canyons, debris basins capture the sediment, gravel, boulders, and vegetative debris that are washed out of the canyons during storms. 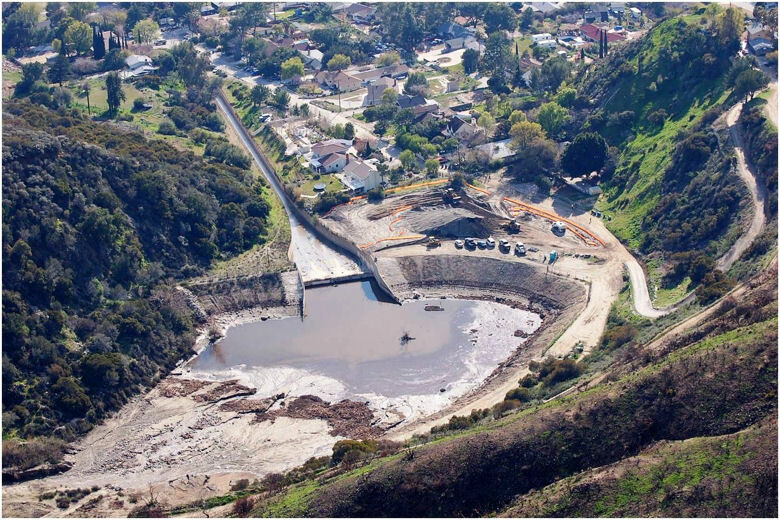 The debris basins capture the material and allow the water to flow into the downstream flood control system. If these materials were permitted to flow downstream, blockage could occur in the system, causing localized flooding and property damage. Increased sediment loads in storm flows also accelerate surface wear and thus shorten the service life of the system's concrete channels and drains, causing large-scale, multi-million dollar re-construction projects. These projects can have their own environmental impacts, such as traffic delays and noise. By capturing the debris in basins we ensure that the drainage systems remain unplugged and operate smoothly during storm events with an extended service life. 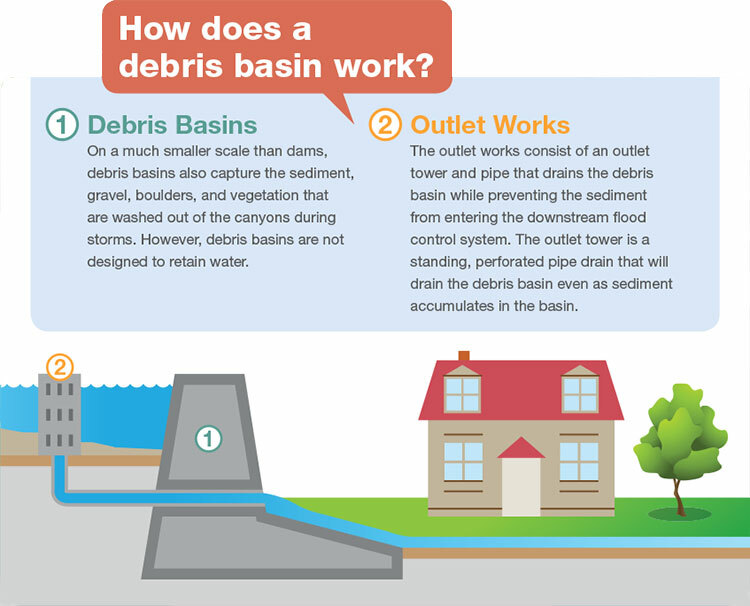 Watch a video about Debris Basins. Moving the sediment out of a debris basin requires excavation equipment and numerous dump trucks. Due to a debris basin's function to protect neighborhoods, most often residential ones, these dump trucks have to utilize the local streets to transport the sediment to a Public Works' sediment placement sites or some other authorized disposal sites. This presents certain regrettable but unavoidable consequences such as dust, noise, and increased traffic and travel times along the streets compromising the haul route. However, if the basins were not cleaned out, even worse consequences of debris flows and localized flooding would cause significant damage and endanger local residents. Understanding these possibilities hopefully helps residents understand and better endure short-term inconveniences along a haul route.